The plantar plate, also called the volar plate, is located at the ball of the foot, and is on the plantar or bottom of the foot, under the metatarsal heads. It is the part of the foot where the base of the toes meet the long metatarsals of the foot. The plantar plate is made up of collagen Type I fibers that forms a cover over the metatarsophalangeal joints of the metatarsal heads. This fibrocartilaginous structure of the plantar plate helps to stabilize the Metatarsophalangeal Joint. The purpose of the plantar plate is to provide and maintain stability at the Metatarsophalangeal Joint (MTPJ), and create joint stability. The MTPJ area however, where the toes meet the rest of the foot can be injured and become inflamed from a sudden force, causing an upward motion of the toes, or dorsiflexion; however, a plantar plate injury can also occur with excessive walking. 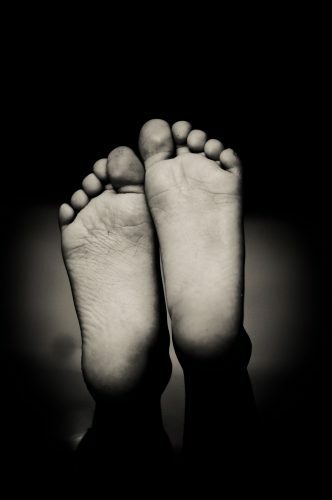 The push off motion of the toes while walking causes pressure at the MTP joints of the foot. This little pressure over time, can lead to microtrauma of the plantar plate, and ultimately to a plantar plate injury. If the plantar plate does tear, the creates an unstable toe, and as the deformity progresses, soon a hammertoe will develop. A chronic plantar plate injury most commonly occurs with microtrauma to the toes that occur over time and results in a progressive deformity, which means that it gets worse over time. An acute injury is a sudden upward force of the toes, or a dorsiflexion motion of the toes that can lead to significant injury the plantar plate, i.e. total plantar plate rupture. A commonly seen plantar plate injury results from an existing bunion or HAV deformity that starts to put pressure on the 2nd toe. This pressure exerted on the 2nd toe from the bunion causes increased load or stress on the 2nd Metatarsophalangeal Joint (MTPJ), leading to a chronic hammertoe deformity. An acute injury can result from a turf toe. A turf toe is a sudden upward motion of the toe, typically seen with contact sports, and other sports requiring running, starting and stopping suddenly and side to side motion of the feet; such as football, baseball, basketball, or tennis. Once an injury to the plantar plate occurs, it can weaken the 1st MTPJ structure, which can in turn cause a bunion or a Hallux Abducto Valgus (HAV) deformity to form. If the 1st Metatarsal is short, and the 2nd metatarsal is longer than the 1st, this causes increased pressure and load onto the 2nd metatarsal head while walking, or running, resulting in a chronic plantar plate injury, and subsequent hammertoe deformity of the 2nd toe. Plantar Plate Tear is also referred to as pre-dislocation syndrome, cross over toe deformity, or floating toe syndrome. The symptoms that people experience depends on the location of the plantar plate tear, as well as on the severity of the injury. The first indication of a plantar plate injury, or inflammation is pain at the ball of the foot. When this pain starts to become persistent, this is might be a sign of a plantar plate injury. The persistent pain is accompanied by swelling which extends to the dorsum or top of the foot. This swelling feels like a fullness in the joint. This fullness is the increased fluid build-up in the joint, or increased inflammation. Another interesting symptom is that when the toe is pulled downward or plantarflexed, in people with a plantar plate injury, the downward motion causes pain relief! The most common metatarsals affected are the 2nd and 3rd metatarsals. Initial treatment at home might include rest, ice to the affected area (20 minutes on and 20 minutes off), and Non-steroidal anti-inflammatories (NSAIDs). When treatments at home do not alleviate the pain or inflammation, the next step is to see your Podiatrist or Orthopedist. One of the first tests a doctor will do is a “Lachman Test” or the “Drawer Test”. This is a test that is done to test the integrity of the plantar plate. This test is done to try and find out if the plantar plate is ruptured. The doctor will pull on the toe affected toe upwards or dorsally, while holding the rest of the foot, including the metatarsals stable. If there is greater than 2mm of movement or displacement of the toe, specifically the proximal phalanx of the toe, then this indicates a plantar plate rupture. When the doctor pulls the toe downward, or plantarflexes the toe, there should be no pain. In fact, there should be a significant amount of pain relief. This is way to identify and differentiate an inflammation of the joint capsule, or capsulitis from a plantar plate injury. With a capsulitis, the entire joint is swollen and inflamed, as well as the capsule or the cover over the metatarsal head, and there is pain with upwards as well as with downward motion. Pain is also noted on palpation of the plantar plate, or when the doctor applies direct pressure to the plantar plate. The next step in diagnosing a plantar plate injury is to take an X-Ray. On the X-Ray, if there is a plantar plate injury on the 1st metatarsal, the X-Ray shows that the 2 small bones on the plantar or bottom of the 1st Metatarsal head are moved closer to the 1st MTPJ as compared to the contralateral foot or the other foot. This change of position of the sesamoids indicates an instability of the plantar plate structures. The sesamoids and the plantar plate are closely held together under the 1st Metatarsal head. This shift in position of the sesamoids indicates a disruption of the plantar plate complex. If a plantar plate injury has occurred on the lesser metatarsals, X-Rays might not show any change in the integrity of the joints or plantar plate. Therefore, with injuries involving the lesser metatarsals, with a severe injury, or to see the extent of an injury to the 1st MTPJ, an MRI (Magnetic Resonance Imaging) can be ordered to diagnose the extent of the plantar plate injury. An MRI is more accurate than an Ultrasound for diagnosis of a plantar plate injury. With an MRI, the doctor is able to visualize the plantar plate more clearly. A complete tear can be seen right away, however a partial or mild tear can be missed or not clearly identified. Using both clinical examination, in addition to the information gathered from an X-Ray, and Ultrasound or an MRI, a doctor can identify the location of the plantar plate tear, and the severity of the injury. Once a diagnosis has been made, a treatment plan will come together. For partial tears of the plantar plate, or complete ruptures of the plantar plate, immobilization, and decreasing the inflammation in the area are key requirements in a complete treatment plan. NSAIDs or steroids to control the pain and inflammation. Physical therapy, including light therapy or ultrasound for the increased healing time, and decrease of inflammation. Custom foot orthoses with dispersion pads embedded into the orthotic to disperse the pressures or even remove pressures placed on the plantar plate. Toe splints and taping of the toe(s) to keep the toes in the desired position. If this does not work, casting and crutches for 6-8weeks to fully immobilize the foot; this is recommended to fully heal the plantar plate injury. Another new technique that has been used in recent years includes Platelet rich plasma (PRP) therapy, where the doctor injects the patient’s own platelets into the injured plantar plate in order to allow the body to naturally regenerate and repair its own injuries. Finally, if conservative treatments do not alleviate the pain, or the injury is very severe with a complete plantar plate rupture, surgery might be the treatment of choice. Surgery involves going into the foot and actually suturing the torn plantar plate back together. Dr. Sharon Joag, DPM is a Podiatrist in Old Bridge, NJ and has been practicing for 14 years. She graduated from the New York College Of Podiatric Medicine in 2002, and had 3 years of surgical training at Metropolitan Hospital, Lincoln Hospital and Passaic Beth Israel Hospitals in New York and New Jersey.